NOTE: Picture is of a silver non-slab-side Fiber Optic Model that is no longer available. 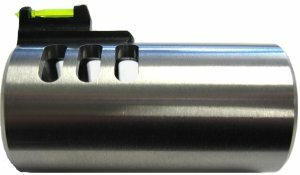 Large, single chamber compensator with six separate ports gives controlled release of muzzle gas for almost recoil-free rimfire shooting. Inner, rubber O-ring gives positive gas seal. Installs easily by removing factory front sight and using existing hole. This V-Comp also features Hi Viz fiber optic sights designed specifically for the Volquartsen V-Comp. The sight comes standard with five light pipes and installation tool for quick change capability. Weighs 4oz, Fits Ruger MKII, MKIII and 22/45 models with slab side barrels.